The next step of your wedding is the much-anticipated honeymoon that you have always dreamed of. After the stress of planning a wedding, all you can envision is an exotic cocktail in your hand and sand between your toes with your beloved one sitting beside you. There is nothing like bathing in that post-wedding fuzz, and switch off all connections with the outside world to plunge in an intimate setting oozing romance in the air. Imagine luxuriating in private plunge pools overlooking the ocean, showered with every luxury, from rose petals scattered on four-poster beds, to champagne on the terrace. Picking a destination can be proven tricky. Most of the couples expect an idyllic romantic summer vacation with no risk of a monsoon. Wishing for a paradisiacal location, lying on the sun soaked beaches and ocean breezes brushing over your face is undeniably a once in a lifetime honeymoon trip you can imagine. 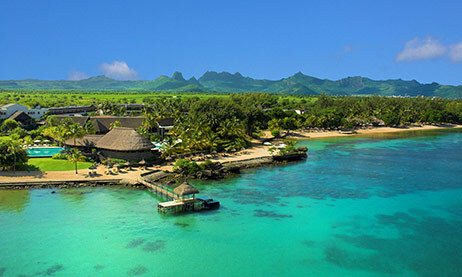 Mauritius has a high rank in honeymoon destinations in the world, that's why it is refered to as the paradise island. 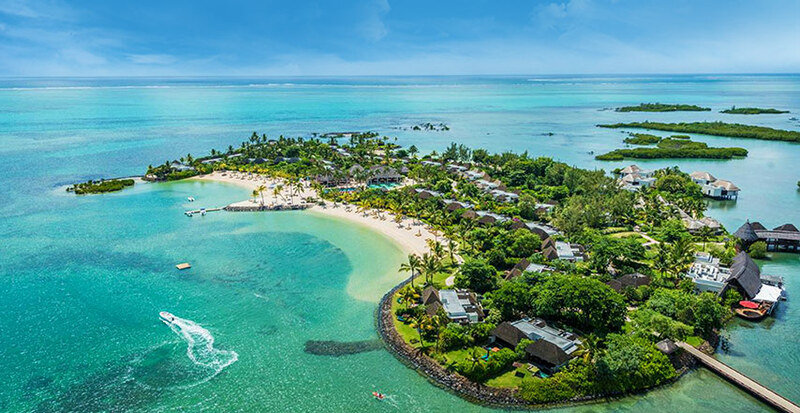 While world-class beaches and incredible natural beauty are the perfect romantic backdrop to luxury hotels and resorts Mauritius also boasts a wonderful melting pot of cultures and cuisines. It has no doubt attracted many of the lovebirds around the world to tie their knots over the past few years. 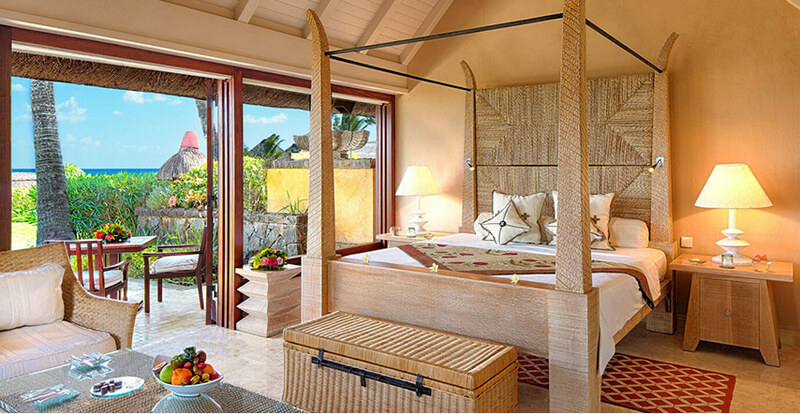 We have meticulously selected some of the ten best honeymoon hotels in Mauritius, ranging from luxurious to budge-based. It is worthwhile to note that discounts and benefits on honeymoon packages are applicable as per the hotels’ conditions. 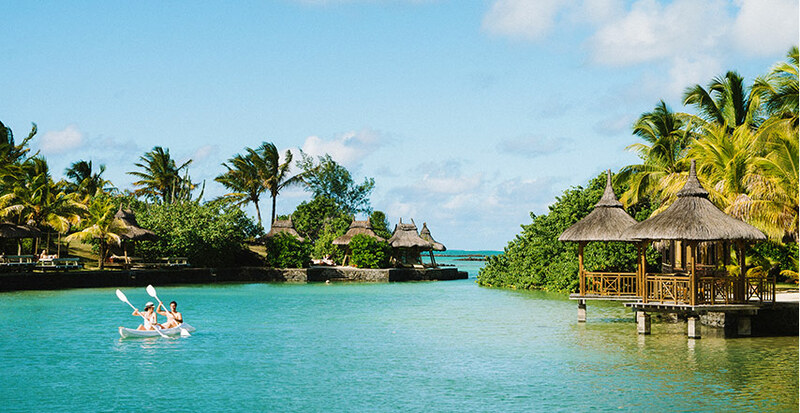 The romantic award winning 5-Star hotel is spread over a generous 27 acres of lush grounds offering picturesque views and elegant surroundings in the Western Coast of Mauritius. 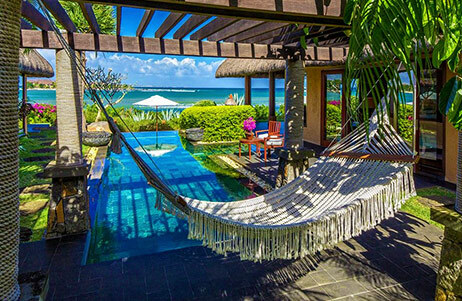 Idyllic for honeymooners and romantic lovers this luxurious resort is owned by a fifth generation Mauritian family and is particularly sought by newlyweds. 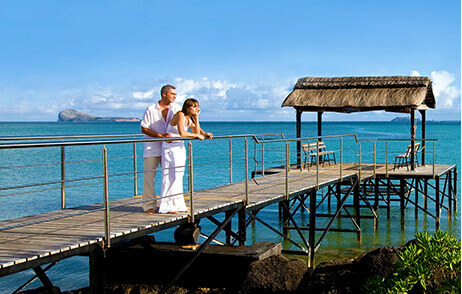 Maradiva is the only all-villa hotel on the island designed with a focus on romance, gastronomy and wellness. Its architecture and interior decor reflect the Indian and Mauritian heritage bestowed to visitors. Honeymooners this is the most highly recommended resort where a promising romantic escapade is awaiting you. Experience the legendary Mauritian hospitality with Maradiva where you can make beautiful memories with the most beautiful, private, and idyllic setting. Newlyweds can look forward to a special romantic touch with intimate private plunge pools in their own villa and couple’s massages and rose petal baths providing total relaxation. 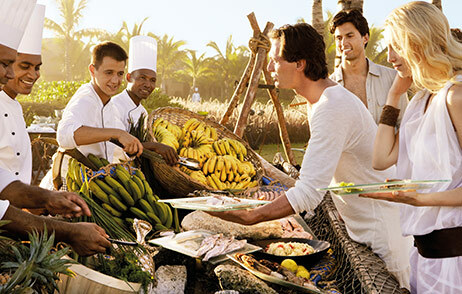 Indulge in a romantic champagne breakfast and private candlelit dinner with a specially designed menu and selected wines on the golden sand at sunset under the Raj tent or enjoy a seafood barbecue in your private villa, with mouth-watering grilled lobster, prawns, fresh vegetables and salads. You can also unwind at the gorgeous Tamarin Bay, a 30-minute walk along the beach, where there is a high chance of spotting the dolphin pod early in the morning or in the afternoon witness the unparalleled beauty of the sunset with your beloved one. 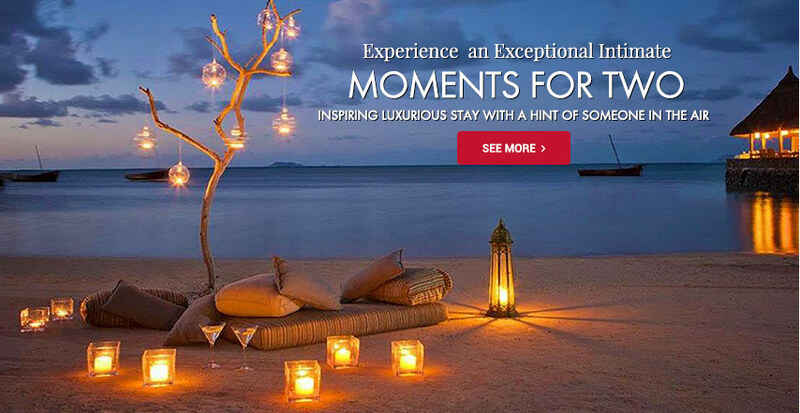 Indulge in a blissful Honeymoon for a minimum of five nights in the romantic retreat. Receive special benefits and get at least a 40% discount on the best available rate. Beautifully tucked away in the Eastern Coast of Mauritius, the all-inclusive and adults-only Ambre Resort & Spa invites honeymooners for a breathtaking romantic stay in the incredible bay of Palmar. Luxuriously designed in a chic, tropical and contemporary outlook, this 4 Star establishment is an idyllic young-at-heart getaway offering an intimate and romantic setting. Ambre is one of the members of the Sun Resorts family which has won over 35 years of sustained excellence and accomplishments. The resort is proudly popular among honeymooners due to its setting, and affordable packages especially designed to meet the demand of the most discerning romantic. Every effort is made to bring the exceptional romantic experience as it is exclusively reserved to adults. Newlyweds can benefit from added intimacy during their precious days alone together following the usual commotion that accompanies a wedding ceremony. 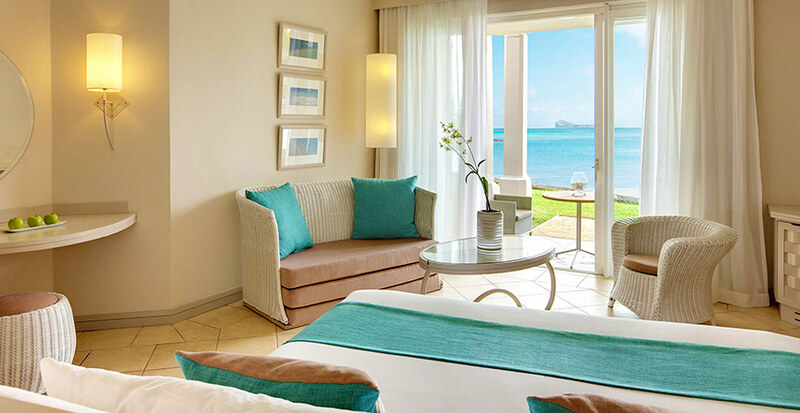 You will be definitely seduced by the warm contemporary décor of the inviting 297 rooms nestled between the coral-reef lagoon and lush tropical gardens, including spacious suites. Blessed by an enchanting and tropical environment, let you partake in a relaxing moment on deckchairs by the superb pool or enjoy romantic strolls along the beach. Ambre have the pleasure to invite you to discover the unique flavors of its fine cuisines in a romantic atmosphere with the pleasant sound of the waves and with some luck, a majestic twilight in the backdrop. Let your taste buds explore the Mauritian specialties reinvented by the creative chefs during your candlelit dinner next to the ocean. For a romantic spa treatment, the Tropical Spa presents you a range of well-being treatments from the a la carte menu created to relieve your stress. The professional masseuses will ensure that you will benefit each single moment of your spa moment. 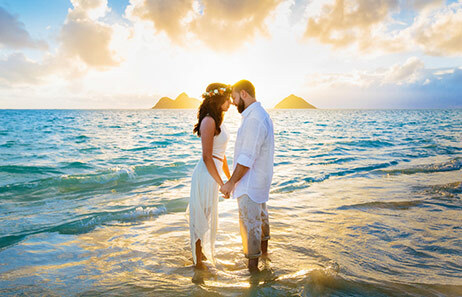 The All-Inclusive Resort has designed a special Honeymoon Package promising full of romantic moments and little details that will ensure your special holiday is a wonderful luxury experience. Breakfast in the comfort of your room or on the terrace one morning during your stay. 1 Bottle of House Sparkling Wine on arrival. Seasonal Fresh fruit basket in the room upon arrival. 1 Tee shirt for the Groom and Pareo for the Bride. 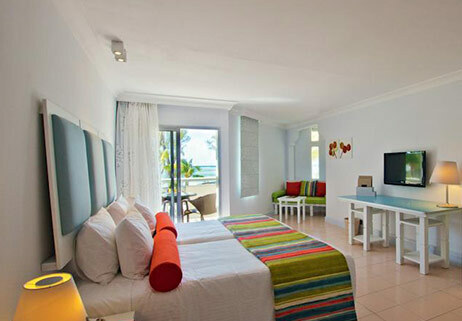 The contemporary and chic 5-Star Paradise Cove Boutique Hotel is a romantic adults-only boutique hotel situated in the most intimate North Coast of Mauritius. Being classified under the exclusive label ‘Relais et Château’ in the premium category, Paradise Cove has no doubt attracted many couples with its unique and innovative you & me concept. Cherish an intimate moment with your lover at one of the thatched love nests while contemplating the natural beauty surrounding you. You can also enjoy a romantic strolls on the winding sandy path through sculpted gardens leading to a lovely cliff-top infinity pool overlooking the awe-inspiring Northern islets. For a romantic stay ensconce yourself in one of the elegant and sublime rooms or suites set in a restful white, with splashes of vibrant colour. The hotel accommodation is adorned with high quality of teak furniture, muslin-draped four-poster beds and balconies. Elements of whimsy include panels of strong colour, pillars and lattice windows, from its previous incarnation as an Indian-themed hotel. The upper floor deluxe premium rooms in two storey buildings are cosy and private. Honeymooners can benefit from the many advantages by staying in the Deluxe Room or Suite. All the rooms open on a terrace or a balcony fitted with a double armchair overlooking the gorgeous coves. Couples can relish tantalising cuisines in one of the four restaurants with the unique ‘Dine Around’ experience. The Pop-in bar is a real invitation to those looking for a vibrant and trendy atmosphere by the sea. At sunset, live acoustic music and piano-bar are an absolute guarantee of a nice evening within a convivial atmosphere. During your stay, a bottle of sparkling wine to toast to your future as well as a platter of exotic fruits to share a romantic moment together. During your stay, a candlelight dinner (excluding drinks) for our guests in Half-Board, Full Board or All-Inclusive meal plan. NOTE: The offer is applicable for stays of 7 nights minimum upon presentation of a marriage certificate not exceeding 9 months, at the hotel’s reception on arrival date. 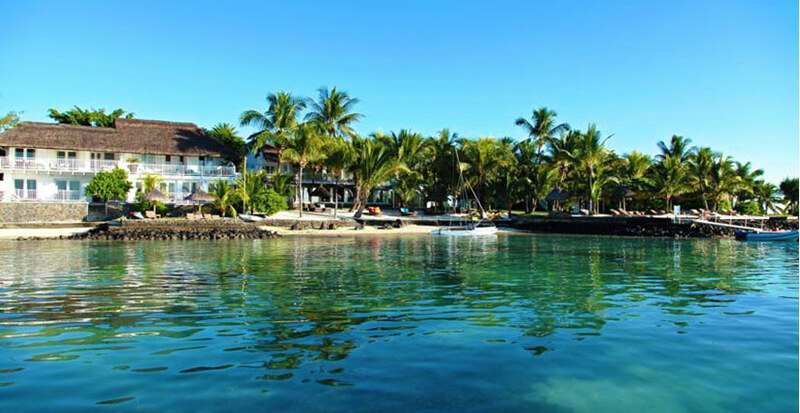 Member of the prestigious Relais et Châteaux since 2014, the Adults Only 20 Degres Sud is a cosy and luxurious boutique hotel located in the North Western Coast of Mauritius. The hotel is ideal for romantic lovers and honeymooners who wish to spend some intimate moments together, away from the bustling Grand Bay village. Set in white and creamy colours with painted wooden walls under thatch, this boutique hotel is surrounded by a lush coconut grove bordered by the scintillating turquoise water of the Indian Ocean. You will also have the chance to contemplate the awe-inspiring views of the nearby gorgeous islets of Coin de Mire, Ile Ronde and Ile Plate. Romantic lovers will surely enjoy the laid back atmosphere where they can unwind in an intimate atmosphere with the main area and rooms built around one of the freshwater pools where sun loungers beckon. The accommodation reflects a true haven of refinement and exclusivity with excellent room amenities. The 36 air-conditioned rooms and suites are decorated and sprinkled with antiques in the manner of a private home. The Charm rooms are smallish which you can consider for an upgrade. The four spacious Austral suites are right on the water's edge, with four poster beds, nespresso machine and a plunge pool or jacuzzi. As for the culinary experience you will have the privilege to taste the new a la carte menus; a Mauritian theme on Sundays, and a lovely gastronomic cruise, where eight people can dine on the hotel's vintage 1920s motorboat, Lady Lisbeth and a catamaran trip to an exclusive restaurant in a 19th- century ruin, now a listed building, on Flat Island. Couples who wish to indulge in fun activities can try windsurfing, sailing or kite surfing in the bay, relax with a book or board game on a sun lounger or revitalize in one of the body treatments at the hotel spa. 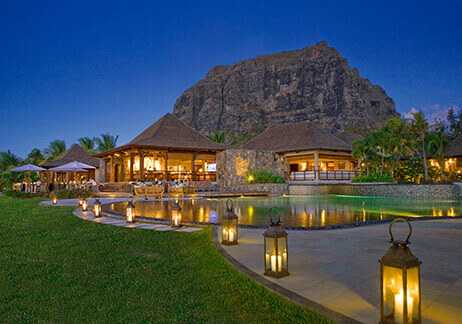 Proud member of the luxurious Lux Resort, the 5 Stars LUX Grand Gaube invites honeymooners for an intimate and secluded romantic retreat in the Northern Coast of the island. Time seems to stop with the lush green surroundings, and incredible views of the enchanting isolated islets. Lux Grand Gaube reflects a Mediterranean-inspired décor with its thatched roofs, white washed walls and vibrant bougainvillea flowers hanging over the balconies. Lovers allow yourself to settle comfortably in one of the sea facing accommodation ranging from rooms, suites to villas. The decent-sized superior rooms are in soft orange, larger deluxe rooms in turquoise with marble bathrooms, and second floor junior suites, in sand and ochre, have a whirlpool bath overlooking the sea. Serenity and natural beauty radiate at the adults-only peninsula where you can find a picturesque private cove and a cinema paradiso in the shade of a Banyan tree. You can also spend some quality time with your lover lying on the sun lounger, or swim in the turquoise sea water. You are offered with a variety of dining options featuring the karma house which is the hotel's gourmet restaurant; it comes with an open-air terrace, and a walk-in wine cellar. There is also the modern Abalone seafood restaurant and a poolside bar that serve grilled meats and tropical cocktails. The main restaurant- Kitchen offers breakfast buffet, and consists of a lively themed evenings. Couples can choose from a wide selection of activities like beach-volley, tennis, windsurfing and kayaking to enjoy some fun moments. Those who wish to rejuvenate completely then the LUX* Me spa is where you will find many relaxing treatments, massages and scrubs. Honeymoon is celebrated with much love and pomp at the 5-Star boutique hotel-Shanti Maurice where couples will live each and single moment of your love story. Spend wonderful days and nights in a pure romantic atmosphere where you will experience blissful days, lively nights and round the clock romance at Shanti Maurice. Shanti Maurice reputed for its high standard hospitality is found in the wilder unspoiled South of Mauritius between Blue Bay and Le Morne. Upon arrival, you will instantly notice the friendly and warm hospitality of the staffs. Be greeted with the tropical coconut water in ceramic black cups and start a memorable stay ahead. 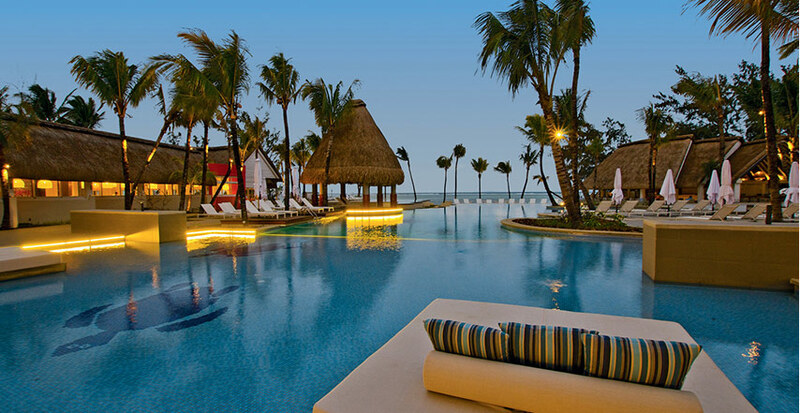 The 36-acre of blissful fragrant tropical garden with its lush green coconut palm trees offers honeymooners the perfect tropical romantic hideaway. The luxurious resort is designed in a rustic yet chic look which blends easily with the Creole concept inspiring tropical vacations. Begin your marital life by plunging in the serene, exotic and yet luxurious setting where newlyweds will have the opportunity to watch dolphins, indulge in fun adventurous activities or simply relax at the award winning Nira Spa. The spa is one of the largest and most comprehensive in the Indian Ocean. With its 25 treatment rooms, the award winning Nira Spa is built around an enchanting tea pavilion, lily ponds acts as a revitalising spot- an ideal retreat vacation for couples! Lovers enjoy the ultimate enclave of the Shanti Villas which lie in the middle of lush landscaped garden, with private swimming pool and Jacuzzi. The top notch villas are composed with luxurious amenities, large windows with expansive views and spacious balconies under thatch-all which promise for a comfortable stay. Romantics do not forget to head to the Fish and Rhum Shack, where a remote stretch of beach is transformed with tiki torches and driftwood furniture into a hedonistic sea-side hangout. This is where you can get into a party mood; you have a selection of mouth watering seafood such as large lobsters, and giant prawns. Additionally, you will find the ‘Shabby-Chic’ rum shed capturing the essence of a bygone era, offering the largest collection of rums in Mauritius, with over 180 types from 36 countries. The Heavenly Honeymoon Packages gives you the ultimate honeymoon experience. From your private Romance Concierge, over a tree planting ceremony and a “Sand Castle” lobster dinner to a beach massage with sounds of Sega music and your own “Mr. & Mrs.” rum blend-an exceptional honeymoon at Shanti Maurice! Are you a ‘foodie’, ‘wellness’ or ‘adventurous’ couple? Experiences can be selected depending on your preferences. 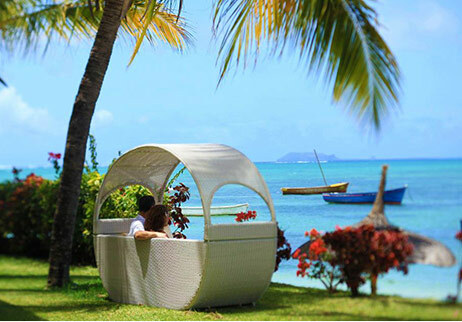 Celebrate your honeymoon or wedding anniversary at Shanti Maurice and benefit from the best value for money. 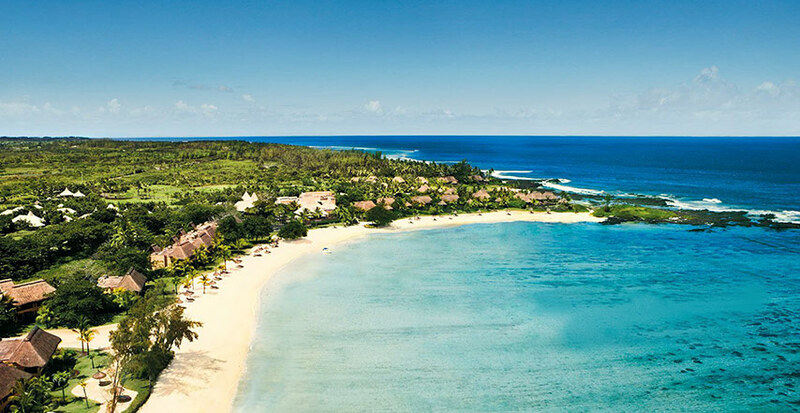 Embark on an ultimate honeymoon journey at the world class Four Season Resort at Anahita-one of the best honeymoon destinations located in the Eastern Coast of Mauritius. This blissful sanctuary of serenity and rejuvenation overlooks majestic mountains, surrounded by verdant exotic gardens with mangroves, and the glistering water of the Indian Ocean-all settling in a perfect harmony. Honeymooners celebrate the beginning of your married life in the tropical atmosphere, modern dining, fun and adventurous entertainment at Anahita. Feel the warmth of the friendly hospitality with the welcome bottle of sparkling wine or champagne and springy macaroons to toast to your future happiness. An ideal retreat for an upmarket sunshine break where an over-water spa, and Four Seasons' legendary service combine to create a perfect environment for relaxing in style. The lavishly designed garden and ocean view villas offer you to sip a luxurious lifestyle alongside their private pools on the terrace offer incredible nature views. These well appointed accommodations are filled with natural lights, and decorated by contemporary wood and stone accents. They are spacious, luxurious, with his-and-hers basins, a generous bath, a shower on the back patio. From the sun loungers in the garden, you could hear the waves crashing on the coral reef inducing a relaxing and quite moment for two. It is perfect for couples happy to be sequestered in their living chambers; there is no need to leave the resort. You can order a romantic meal through In-Villa Dining, or set out to explore the best of Mauritius. Cherish a relaxing moment with the award winning Spa in a tranquil environment. A buggy could be arranged to ferry across the bridge for an appointment at the spa where the treatment rooms are perched over the Indian Ocean on stilts, with classes exposed to the elements.Carefully blending the African roots of Mauritius with the learned traditions of Asia, the Spa fuses rich cultural elements with modern-day techniques, to ensure a holistic wellbeing experience of the physical, emotional and spiritual bodies. Enjoy refreshing herbal teas and fresh tropical fruits at the double sun loungers after strenuous yoga sessions. There are plenty more activities designed for loved-up couples. At the beach, the staff will keep you topped up with towels, iced water and snacks such as coconut ice cream and melon. Kayaks, sailing boats and pedalos are also available. Additionally, the resort offers you exquisite culinary experiences with its eclectic range of restaurants from the finest Mauritian and pan-Asian delicacies to fresh seafood, classic Italian dishes and a contemporary grill. Lovers be ready to spend the most memorable candlelit dinner on the terrace of your villa. Relish a four-course dinner of bouillabaisse and assorted local seafood. The resourceful Concierge and dedicated staff will be glad to arrange memorable experiences uniquely for you. This package requires a four-night minimum stay and can be booked back to back. Daily breakfasts are available at Beau Champ and through In-Villa Dining. Daily three-course dinners are available from the à la carte menus at any of our restaurants, excluding Il Forno, or through In-Villa Dining, and do not include beverages. A tray charge applies for In-Villa Dining. Special culinary events and seasonal promotions will be available for an additional charge. Please note that this package is available only to couples travelling no more than six months after their wedding date. The Resort may request a copy of your marriage certificate to determine your eligibility. 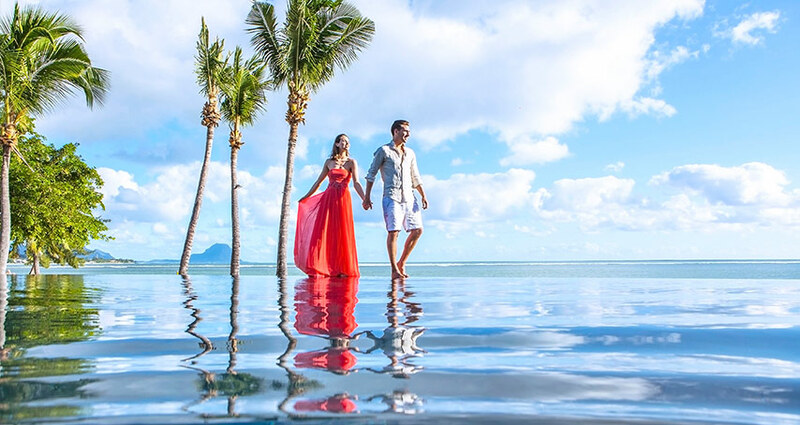 Inspiring luxurious stay with a hint of romance in the air, The Oberoi Mauritius welcomes honeymooners and couples to experience an exceptional intimate moment for two. This 5-Star resort lies along the Turtle Bay on the island’s curvaceous North-Western Coast in over 20 acres of beautiful, subtropical gardens and with an impressive 600 meters of beachfront. The Feng Shui-style waterfall cascades into a lake of water lilies and Koi carp at the entrance will surely enchant lovers as they step in the resort. There are also mystical stone head sculptures from Indonesia that are featured in the grounds and Asian artifacts which are peppered throughout the resort. The enticing palm-thatched villas, huge infinity pool flanked by columns, statues and urns have been luxuriously designed to meet the expectation of the most discerning guests. As couple you will have a bouquet of unique experiences to begin your wonderful marital life. Serenity prevails at the luxurious establishment, this is where lovers can forget the world back behind, and savour each and every moment. Settle comfortably in one of the lofty sea-facing luxury pavilions and walled villas named after plants in the garden. There are also large suites with bougainvillea-clad terraces that accentuate the beauty of the resort. The accommodation consists of romantic four poster beds in American oak, cane furniture, a sunken bath in palest marble, swimming pool, a romantic dining pavilion as well as private lush exotic gardens. Enjoy the warm sunlight on your skin as you lie on the fine white sand, or swim in the crystal clear turquoise lagoon. And if you want some adrenaline kick choose from the many water sports activities-everything from sailing to diving and water-skiing - as well as the opportunity to swim with dolphins. 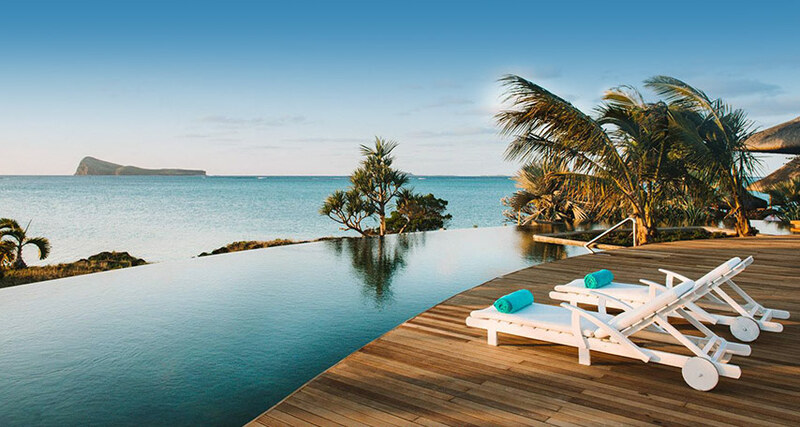 You can dine on a private corner of a tropical beach, watch the sun set over the Indian Ocean from your own private pool, or simply sit back and soak up the views. The blissful and secluded spa at The Oberoi is designed in the Moroccan-style spa framed by lush indigenous and tropical plants. There is a range of international therapies which harmonise modern sciences and ancient philosophies. Couples can also experience hatha yoga, t'ai chi and meditation. Luxury Pavilion, Luxury Villa with Private Garden and Luxury Villa with Private Pool: Complimentary Stay for The Bride on Bed & Breakfast basis. Presidential Villa with Private Pool & Royal Villa with Private Pool: 75% discount for The Bride on Bed & Breakfast basis. 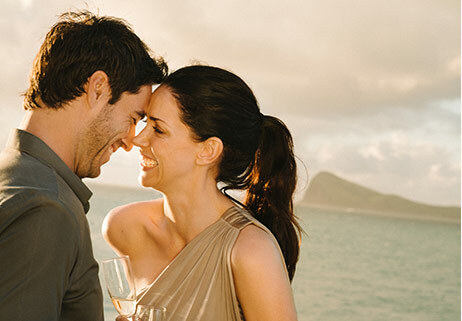 Being a member of the reputed LUX Resort brand, the LUX Le Morne invites honeymooners to initiate a wonderful married life in a paradisiacal environment of the Southern Coast of Mauritius. The 5-Star resort is bordered by coconut palm trees and white fine sand with a backdrop of the majestic rugged le Morne Brabant. Engulfed by sheltered coves and sparkling aqua-blue waters, this UNESCO World Heritage site is known for its spectacular sunsets. Inspired by its glorious nature surrounding, the resort offers picturesque chalets dotted around lush tropical gardens with pools where couples can unwind and relax. The chalets blend harmoniously with nature, and are available into several categories. The Honeymoon Junior Suite in particular is reserved for honeymooners on vacation. The suite features luxurious amenities, beautifully furnished balcony, spacious bathroom with whirlpool and dressing room. For a more intimate and rejuvenating experience newlyweds are encouraged to indulge in the LUX Me Spa where they will feel more pampered with a wide range of treatments. LUX Me therapists will personalise treatment of your choice using an exclusive range of LUX* ME products. Besides, the spa treatments couples will be able to boost their energy level through yoga and meditation sessions. Make your stay an exciting and fun one with the myriad leisure water activities at the hotel. Try the windsurfing, pedal boats, kayaks, sailing, snorkelling, glass-bottom boat trips or water skiing for a fun time! On top of that Le Morne is the renowned for its world famous kite-surfing spot ‘One Eye’. Honeymooners benefit a 70% off for the second person per night, plus get pampered with gifts by the hotel. A copy of the Wedding/Civil Partnership certificate must be sent to the Reservation department as part of the booking procedure and will be required at check-in. Wedding/Civil Partnership certificate must not exceed 12 months from date of issue at time of travel. For every room booked at the special Honeymoon rate & conditions, the official Wedding/Civil Partnership certificate should be presented upon check in at hotel. Should this not be respected, the hotels reserve the right to review its pricing. Offer valid on bed & breakfast, half board or all-inclusive basis, based on the hotel & destination selected (details available with our Central Reservation Office). All reservations have to be guaranteed at the time of booking by a credit card. Based on the famous novel of Bernardin de St-Pierre, the adults-only Veranda Paul & Virginie is a real cocoon for romantic honeymooners to escape. 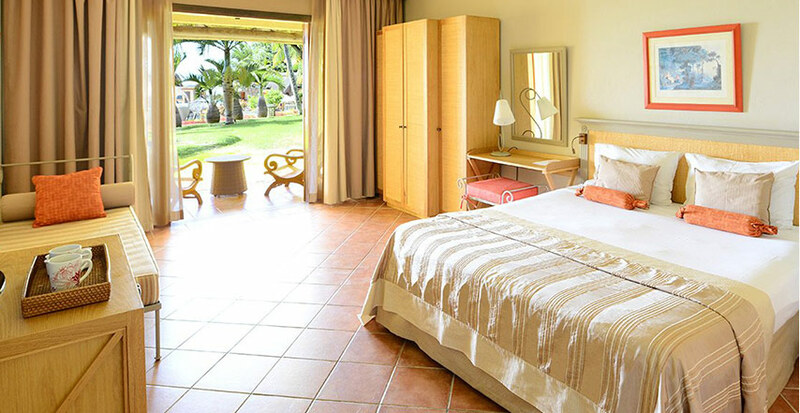 Located in a tranquil fishing village of Grand Gaube-North Eastern Coast of Mauritius, the hotel is filled with loads of romantic little touches. The yellow painted walls, stone pillars, and rattan furniture under the thatched roof portray an exotic setting. Warm and cozy, this is how you feel once you enter the establishment. The scented air is a pleasant blend of chocolate, vanilla and coconut perfume to set you in a romantic mood. To add more romance in this blissful environment, double sun-beds and love seats are scattered overlooking the awe-inspiring ocean view. At Paul et Virginie hotel time seems to stand still, everything around evokes a sense of pure relaxation and intimacy. Take a stroll with your loved one on the fine sun soaked beach, contemplate the beauty of the sailing boats and the traditional “pirogues” on the beautiful horizon, relax in a hammock for two, and enjoy a scrumptious romantic dinner. The hotel’s cosy accommodating rooms are bright and breezy with views to the sea and direct access to the beach. The decor combines local wood and wrought iron, and is designed around natural colors with a touch of trendy grey. But it is in the details that you will find special charm, such as the old prints taken from Bernandin de Saint-Pierre romantic novel Paul et Virginie. There are two restaurants (Ile de France and Le Saint Géran) where you can savor the richness and variety of the Mauritian cuisine, indulge into international specialties or choose from a rich sea food menu. The Poudre d’Or bar is where the fun-loving crowd gathers. Throughout the day you can sip cocktails by the pool, and it’s also ideal for an after-dinner drink ensconced in large comfortable chairs. The Veranda Paul et Virgine Hotel & Spa is the ideal place if you want to explore the sea with your other half whether it’s onboard a glass bottom boat, a small sailing dinghy, sailboat or a windsurf. The more sportive couples can opt for water skiing, deep-sea diving and fishing. To complete this marvelous experience, rejuvenate yourself at the Seven Colours Wellness Spa of Veranda Paul & Virginie hotel where the atmosphere is peaceful and intimate, perfect for couples. The Bride receives 40% discount off accommodation costs based on meal plan booked. One candlelight dinner at Saint Géran (excluding seafood). 5 night minimum stay is required. Applicable in Superior, and Provilege room categories only and on meal plan booked. Other Conditions as per the Hotel. 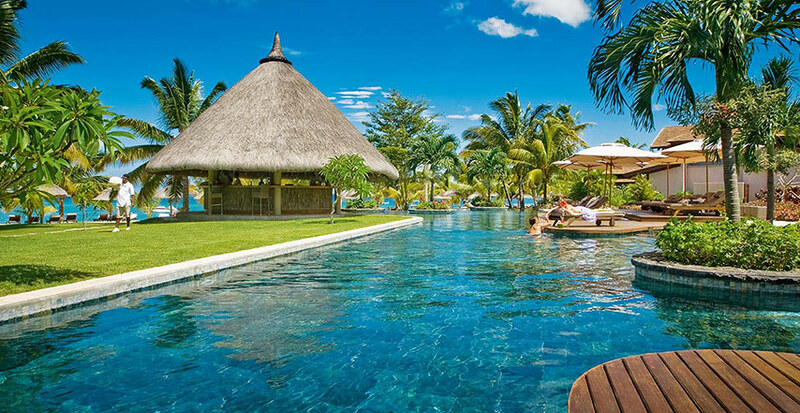 Nestled on a beautiful historical estate in the North Western Coast of the island, Maritim Resort & Spa is very well known for its 62 acres of lush gorgeous garden and peaceful picturesque setting along the Turtle Bay-the first protected marine park of Mauritius. Experience top notch accommodation in the honeymoon suite which is an exclusive retreat for newly-weds. The suite is meticulously designed to the highest standards both aesthetically and in terms of soothing comfort equipped to suit the needs of leisure. With its private rooftop huge terrace with a whirlpool and intimate deck, romantic couples will surely make some memorable moments. The 5-Star resort is a specialist of weddings on the island over many years. With the right expertise in hands, Maritim Resort & Spa offers you the freedom to choose from a wide range of the ‘magic moments’ especially tailored for honeymooners. The Magic Moments look promising as you will have a unique selection of exclusive and intimate experiences on the Estate just for the two of you. To extend the romantic journey after your wedding the resort will ensure that you experience the ultimate honeymoon experience of a lifetime. Surprise your partner with a delighting breakfast on the beach, picnic lunch by the waterfalls, sunset catamaran cruise or moonlight dinner on the jetty. Additionally, get the chance to experience romantic rides in a horse carriage! For a rejuvenating experience of the two of you, indulge at the Maritim Tropical Flower Spa with an exclusive romantic relaxation areas including couples double cabins, a private garden suite and special couple’s spa treatments and wellbeing experiences. There are 8 superlative dining venues to be found at Maritim Resort and Spa, offering a wide variety of dishes and beverages to suit all palates. The main restaurant is Belle Vue, a charming all-day dining venue which boasts a prime location overlooking the pool and the sea. With its open cooking stations and lavish buffets, this restaurant offers a diverse selection of international and local specialties. Book a suite and benefit from the “Exclusive Suite Package”. 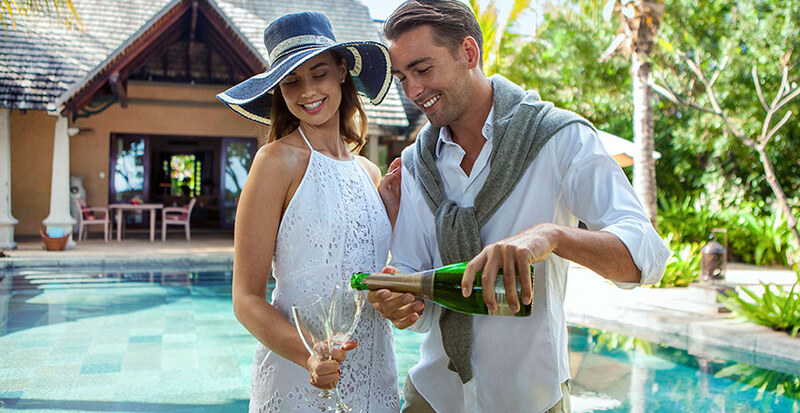 This package will pamper you with tailor-made services including butler service during your stay, one bottle of Champagne upon arrival, welcome gift and privileged access to a dedicated “Suite Beach”. Enjoy the delicacy of relaxation with the services of your private butler.